This paper empirically measures the impact of sectoral energy price differential between trading partners on Indian exports. Using dynamic gravity model, we estimate the response of Indian exports for 11 energy-intensive sectors to sectoral-level energy price asymmetry. We observe the absence of the contemporaneous effect of energy price differential on Indian exports, but the presence of persistence effects. 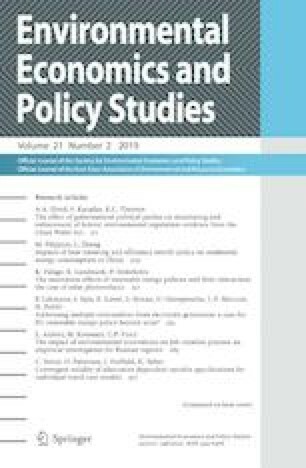 We find that a 10% increase in relative energy prices negatively affects Indian sectoral exports by about 1% ranging from 0.9% for chemicals to 1.4% for non-ferrous metals, revealing a larger impact for energy-intensive sectors. These small effects imply that the concerns of carbon leakage are largely overplayed. This work has been undertaken with the financial support of the South Asian Network for Development and Environment Economics (SANDEE) and its sponsors. Technical support and guidance has been provided by several SANDEE advisors and peers during the course of this research. We acknowledge the comments received from Dr. Celine Nauges and Professor E. Somanathan of SANDEE and the participants of the project dissemination workshop titled “Emboded Carbon Trade and Trade Resistances: Evidence from South Asian Countries” held on August 13, 2015 at the Delhi School of Economics. We are especially grateful to Dr Mani Nepal and Ms Neesha Pradhan for their cooperation throughout the study period, and also acknowledge the help provided by the administration at the University of Delhi. Any errors, opinions, or conclusions are of the authors. Tables 3 and 4 in appendix.